The Best Choices for a Short Stay in Montréal ! 19 lists of quintessential sights and experiences for the best of Montréal ! 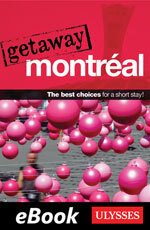 Here’s the digital version of Getaway Montréal from Ulysses Travel Guides, the perfect tool to make the most of a short stay in Québec’s largest city, Montréal. Thanks to its practical format and organization, the traveller will find all the essentials and must-sees in a glance. Fun to consult and to carry thanks to its small format, its colourful and lively layout includes numerous photos of the destination. Easy to navigate, this guide is ultra-convenient. A first section called “Best of Montréal” highlights the best the city has to offer according to different themes, and facilitates the overall organization and planning of your trip to Montréal. The “Exploring Montréal” section then proposes 10 itineraries through the city’s different neighbourhoods. For each route, a precise double-paged map shows the layout of the itinerary, in addition to locating attractions, cafes, restaurants, bars, nightclubs, theatres, shops and hotels, so that you do not miss a thing! A starred rating system and an “author’s favourite” label guide the traveller to the attractions and establishments that stand out. Finally, the “Practical Montréal” chapter is full of useful information delivered succinctly. To add to all this, maps are also located on the flaps of the guide’s cover: a general view of the city, a zoom of the city center and a metro map.